Authorities in India say at least 27 people have been killed after a stampede on the banks of a river where pilgrims have gathered to observe a Hindu religious bathing festival. The stampede occurred Tuesday in the southern state of Andhra Pradesh as tens of thousands of people rushed to bathe in the Godavari River. More than two dozen others were injured in the crush. Prime Minister Narendra Modi issued a statement on his Twitter account that he was "deeply pained" by the tragedy. The chief minister of Andhra Pradesh says the government will offer $15,570 in compensation for the victims. Tuesday marked the start of the Maha Pushkaralu festival, when tens of millions of people are expected to make a pilgrimage to the Godavari River to offer prayers over the next 12 days. Stampedes are a common occurrence in India during religious festivals, where massive crowds numbering in the millions gather in small areas, overwhelming security personnel. 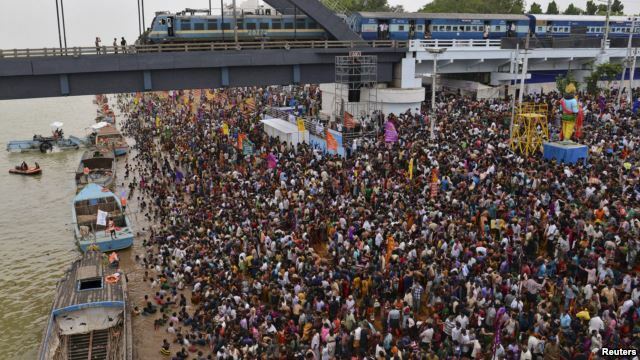 The Godavari Maha Pushkarams started on a tragic note in Andhra Pradesh with 27 people breathing their last in a stampede at the Pushkar Ghat in this city on Tuesday morning. Several of the victims were women, most of them from Srikakulam, Vizianagaram and Visakhapatnam. Police shifted some of the bodies to the Government General Hospital in Rajahmundry. The stampede took place at around 9 a.m. after VIPs led by Chief Minister N. Chandrababu Naidu performed sacred rituals in the river. An unanticipated huge influx of pilgrims into the relatively smaller ghat triggered a crush, in which victims could not be reached for assistance in time. Ambulances stationed near the ghat could not reach the spot due to heavy rush of pilgrims on the pathways leading to the ghat. The Chief Minister expressed his profound sorrow over the death of pilgrims and announced an ex gratia payment of Rs. 10 lakh to each of the bereaved families. Prime Minister Narendra Modi too expressed his grief over the tragedy. 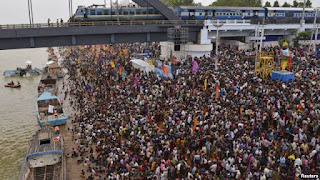 Reports from the epicentre of the tragedy said that it was a result of lack of awareness among pilgrims that they could go to several other ghats in Rajahmundry where the crowd surge was less intense. Appeals made by officials on the public address system went unheeded and policemen at the site were taken unawares by the massive tide of pilgrim arrivals. Sources said that there were flaws in information dissemination to visitors to the town that there were larger ghats available where rituals could be performed in greater comfort.